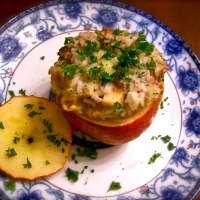 Savory and sweet combined....if you are like me and love apples enough to eat them for dinner, then this is the dish for you. Set out a baking sheet and a 6-cup muffin pan. Use a large cutting board as your workspace; it's about to get messy. 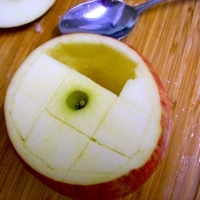 Slice the tops off of each apple, and use a knife to cut a circle around the inside edge, but don't cut all the way through. Then make a tic-tac-toe grid around the core. Scoop out the pieces with a spoon, and discard the core See Photo. Dice the leftover apple and set aside in a bowl. Drizzle diced apples and the apple "bowls" and "lids" with lemon juice. Place each hollowed-out apple in a muffin cup, with the lids on top, set aside. In a large heavy pan, heat olive oil. Add onion, garlic and rice. In a large bowl, mix the ground turkey and dried seasonings together. When onion is translucent, turn the heat down to low and add the ground turkey & almonds. Add a splash of white wine and stir in the fresh herbs, cook for about 2 minutes, just until everything is infused with the herbs. Transfer everything into the bowl. Stuff the apple "bowls" with the filling, pack it down with a spoon. Place the lids back on top and set the muffin pan on the baking sheet. Bake for 20-25 minutes, or until apples have softened. *I should mention that I did cook the extra filling a few minutes longer in the pan, so that the turkey was completely cooked. A truly exceptional recipe. I can't imagine the flavor combo so will have to make them. Great post. 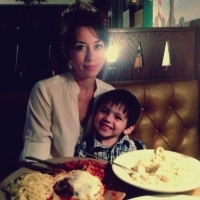 Like icecreamuffin's recipes? Never miss an upload!